It’s the UK’s answer to Coachella and attracts some of the biggest celebrity crowds. Glastonbury this year went pretty much as per usual; lots of mud, Alexa Chung looking fierce, and a whole lot of rainproof parkas. The big sister to supermodel Cara Delevigne had a fair few outfit changes over the course of the festival but managed to look drop dead gorgeous (and totally mud free?!) in every single one of them. 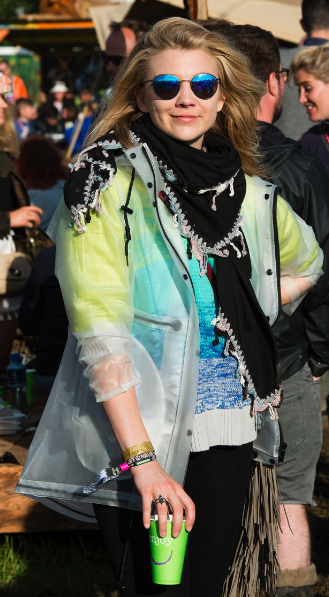 Alexa, aka the queen of Glastonbury, wore her standard ensemble of Hunter boots, eclectic tees and cat eye sunglasses. We particularly loved her day two outfit, which featured a rather ragged looking sweater dress. She performed at the festival but still found time to strut around the grounds and listen to a few other artists. Her day off saw her wearing an oversized blue flannel shirt and matching reflective sunnies. It may have been near freezing temperatures, but Lily Donaldson is clearly too hot to get cold. The Victoria’s Secret model wore a tiny pair of denim cut offs and a singlet layered under a rain jacket during the festival. The Made In Chelsea star stepped out with her co-star at the festival and had a whopping five outfit changes. We love Millie’s slightly off centre but quintessentially English style – check out that military jacket. Whilst it may be R.I.P for her Game Of Thrones character, Natalie Dormer was living it up at Glastonbury looking particularly casual in a toggle tie khaki skirt and Hunter boots. Must feel good after all those corsets.